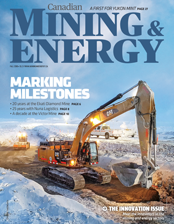 We are now offering a complimentary subscription to Mining & Energy magazine. Simply fill out the information below and we will mail you a copy absolutely free. Mining & Energy is published four times a year and is packed with stories about the personalities, projects and innovations occurring in mining and energy throughout Western Canada. Mining & Energy is only available to residents of Canada and the United States.